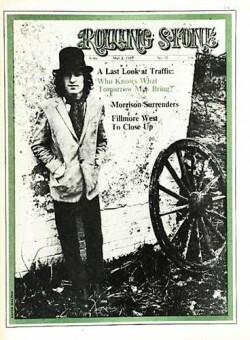 "Steve Winwood: A Calm, Shy, Superfreak"
It was late 1965 and Mike Bloomfield was with Butterfield and I was with the Project. We were sitting in my apartment listening to a recording of a classic blues called "Nobody Knows You When You're Down and Out." We were both aware of Stevie Winwood and we both flashed on how well he sang this song we had heard hundreds of times before by hundreds of other people. "Superfreak." That's the name that's been laid on him by various American singers and musicians, much the same way that Clapton received his early publicity. When Michael and I listened to that record, Stevie Winwood was seventeen years old and that recording was eight months old. In Traffic's stage act he shifts comfortably between organ and guitar. Another of his assets is his guitar playing. "I came through a folk blues thing on guitar, like digging Sonny Terry and Brownie McGhee at first then Buddy Guy, Otis Rush and the rest of them." He picks gospelish runs fused with saxophone-like solos. The whole spectrum becomes apparent now: singer-organist-pianist-guitarist-composer-human-being all in one. A calm, shy, nineteen-year-old English kid. Today, with the large group fatality rate due to personal differences, Traffic stands in an advantageous position. Like Mike Bloomfield and the Grateful Dead, Stevie got a house. His cottage was far from civilization and the only intruders were "occasional poachers." "Eventually," says Stevie, "we'll do our recording up there. It's just a logical step for us." Soon after its debut in England, Traffic lost a member in Dave Mason, who became disenchanted with the traveling and parted amicably. But trios are enjoying a healthy 1968. Witness the Jimi Hendrix Experience and Cream. I believe Traffic to be the most musically versatile of these trios, with more vocal prowess than most four or five-piece contemporary groups. "When Dave left, we lost a limb, but we gained freedomï¾‰spontaneity. With four people it's harder to be free than with three. We had to drop some tunes and add others, but I believe we've got it together now." I agree. We talked about the Fillmore and he noted that the light shows were infinitely more advanced than anything England had to offer and that it was all happening in San Francisco whereas it was not in England. Our talking inevitably brought us to the drug scene. "Drugs show you the door, but they don't open it, they don't take you there. Music is getting honest, real and natural. If drugs enable you to be natural then if fits, but then again drugs aren't always natural. I get the feeling here (Fillmore) that that's what the audience wants: the real you, the natural you. When you stop exploring with drugs, now that's a bad scene. I never want to stop exploring." This is obvious. You see but still you're blind. That soon you're going to break.